In a bowl mix 100g pesto with 50g toasted crushed almonds and set aside. Peel and cut 100g white pearl onions into halves. Divide 1kg Kühlbarra barramundi fillet into 5 portions 200g each. On a piece of parchment paper add 60g green beans, 4-5 pieces of white pearl onions, 3-4 cherry tomatoes and 1 sprig of rosemary. Season with salt and pepper to taste, next add 1 tbsp olive oil and 2 tbsp white wine. 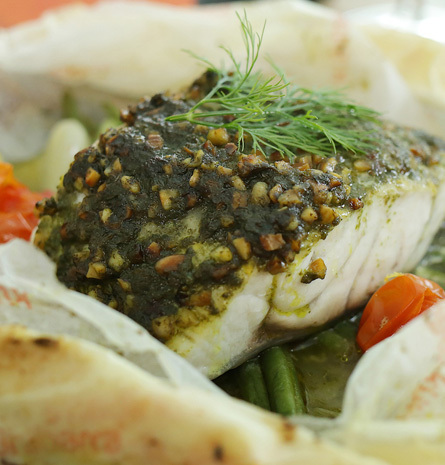 Add a Kühlbarra barramundi fillet on top, season with salt and pepper to taste and spread 2-3 tbsp of almond pesto. Grate lemon zest, add lemon juice to taste, and add 1tsp butter. 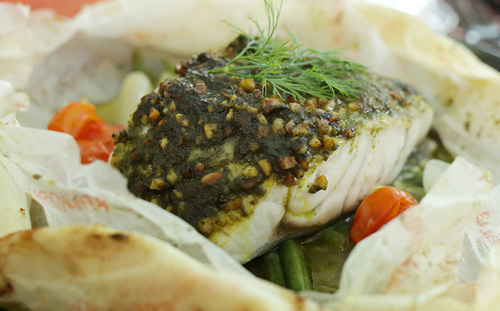 Fold parchment paper over barramundi and seal the edges. Repeat the same for the rest of the portions. Transfer parchment bags to a baking tray and bake for 20-25 minutes in the oven at 200°C. Once cooked, make a cut in the center of the bag, tear open and serve with a garnish of fresh dill. Purchase Kühlbarra’s Wrapped With Love or The Jingle 5 Christmas sets, which includes the pesto, rosemary, and olive oil used in this recipe for extra convenience!